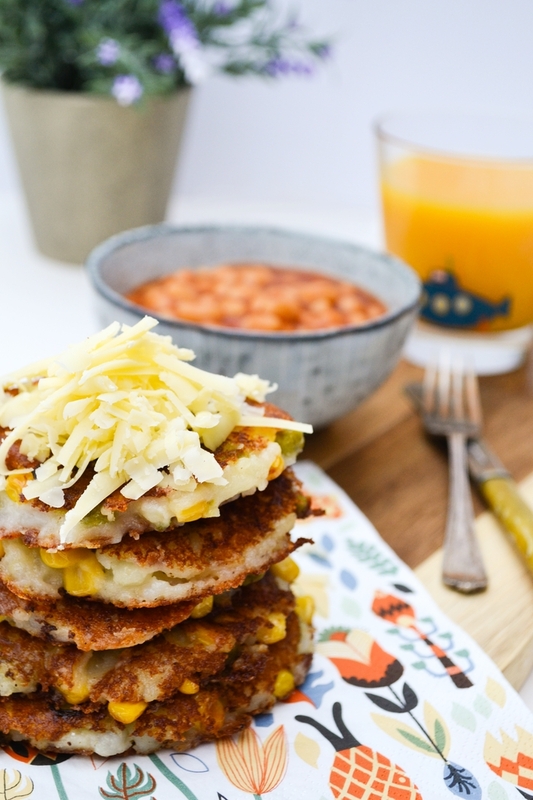 These cheesy vegetable potato cakes were our dinner for tonight. I always cook simple food and share easy recipes, but these are definitely made with Cooper in mind. They are real nursery food or should I say comfort food? Not only are these potato cakes comfort food, but they're a sneaky way of getting more vegetables into Cooper's day. If you have children or a husband like mine who is reluctant to eat vegetables you will appreciate what I'm talking about. Each potato cake is made with a base of mashed potato mixed with peas, sweetcorn and spring onions (also known as salad onions, green onions or scallions). Apart from that there's just some cheese and seasoning added for extra flavour. Serve them with baked beans, which count as one of your five-a-day and a glass of orange juice and we can mark up five portions. GET IN! I made these potato cakes with ingredients from the fabulously low-priced essential Waitrose range. 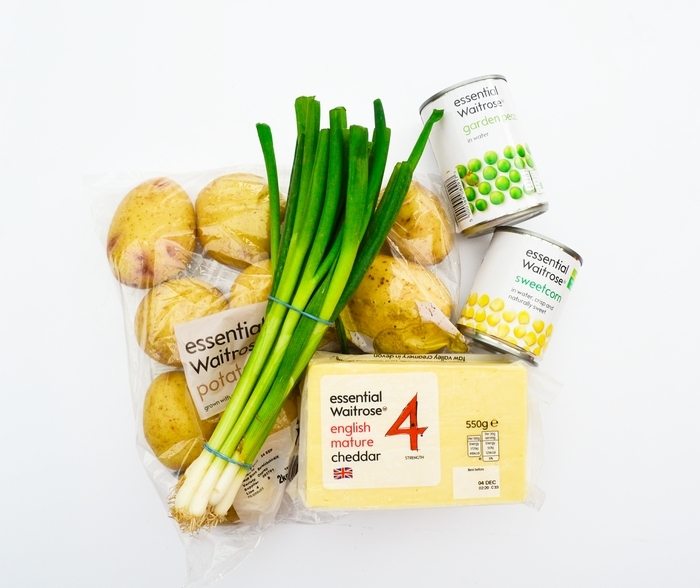 Right now Waitrose are lowering hundreds of prices across their essential Waitrose range, making them the perfect products for families who are trying to live on a budget. It cost be just over £5 to buy the ingredients for eight cheesy vegetable potato bakes. I have a few to pop in the freezer for another night and I still have a nearly full bag of potatoes, some peas, sweetcorn, spring onions and a large block of cheese left to include in other meals and snacks throughout the week. Those are the kind of prices I like. 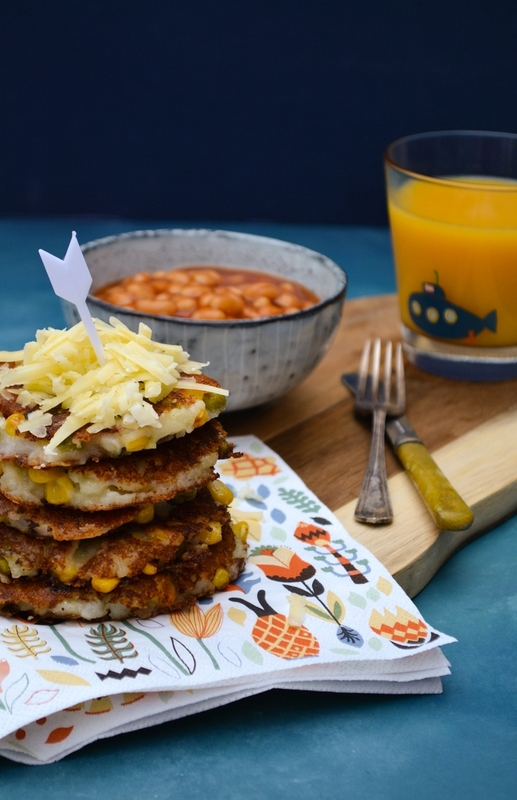 My vegan readers can use their favourite vegan cheddar in these potato cakes instead of cheddar. They will taste just as good and your kids will love them. Strike that! Your whole family will love them. Don't add lots of milk and butter to the mash like you would usually do, you want it drier than that. You can use leftover mash, it will be nice and firm after a night in the fridge. There is no need for eggs or flax eggs as potatoes are a great binder. Don't make the potato cakes too big or too fat. They will just fall apart. You can use any leftover cooked vegetables in potato cakes, just cut them up finely. You can add spices to these cakes. Add paprika for a nice touch of spice or leave out the cheese and add ground cumin and coriander for an Indian style potato cake. Chill the potato cakes for at least half an hour before cooking. They will hold their shape better. You can bake these or cook them in a little oil. Just be patient and give them plenty of time to cook so the outside is crisp, firm and golden. For a more substantial meal serve with veggie sausages and beans. You can freeze these for another day. Alternatively serve them in a burger bun with some salad and your favourite toppings. You could also make these into fingers. Every tried vegetable fingers? Well that! In fact you could make them into finger shapes and roll them in panko breadcrumbs for that crunchy finish. Whichever way you make these and whatever you serve them with, I know you'll love them and they'll become a family favourite in your house too. Cooper certainly loved them. These easy cheesy vegetable potato cakes are the ultimate comfort food. Serve them with baked beans and orange juice to hit your five-a-day. You can add any leftover cooked vegetables to these simple potato cakes for a frugal meal the whole family will love. 1. Mash the potatoes with a little butter (or dairy free spread) and grated cheddar (dairy or vegan).2. Season well with salt and pepper.3. Mix in the sweetcorn, peas and spring onions or any other vegetables you are using up.4. Roll the mixture into 8-10 balls and gently press into round cakes, not too fat.5. Chill for at least half an hour.6. Cook in a little hot oil or bake until golden, firm and crunchy on the outside. 7. Enjoy!. Disclosure: I created this recipe to help promote the essential Waitrose range. I was not required to write a positive review and any opinions expressed are my own. I can totally see why kids would like these! They sound yummy and would go great with a bowl of soup. It's been cold and rainy here this week, so in my mind everything goes with soup this week. Now I never thought of them with a bowl of soup but yes that would work and yes the summer is definitely over. This is a good one, thanks. I love potato cakes - such a good comfort food! Would love to try making the vegan version! Yes, those are just as good if you use a decent vegan cheese. What a great idea for a vegetarian dinner! 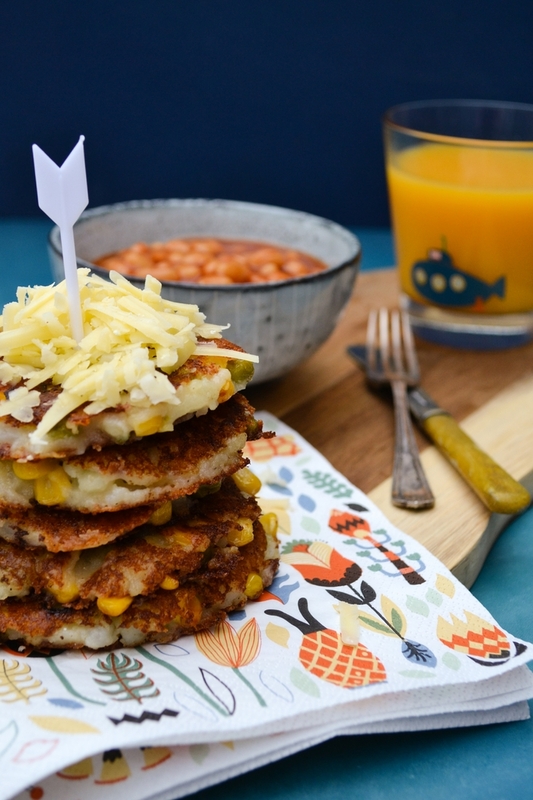 We love potato cakes anyway, but the veg and cheese sound like it's a complete meal. My husband hates veggies, but he does love potatoes. So perhaps I could sneak some more veggies into our diet this way! Really? Well this is the recipe for you. Time to get sneaky! I love how versatile and easy this recipe is. These would be perfect for a light dinner, an appetizer, or a quick snack. Yummy! Oh, my Grandma used to make these... I haven't had them in ages! So thank you for reminding me :) and for making vegan version, especially with tips&tricks. I love the addition of corn, I bet it tastes great! We're having it today! Oh good, I hope she enjoys them. Yes the vegetable fingers are worth a try with the crispy coating, although I imagine they will end up more sausage shape than fingers. Easy cheesy and delish! Such a fun meal to make! Haha yes and fun too.